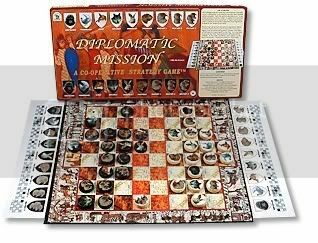 Diplomatic Mission: This game is played on a standard chess board but with a surfeit of pieces, each with their own abilities (Diplomats, Scouts, Bodyguards, Journalists, Politicians, Peacemakers, Military, Royals, etc). The goal is for both parties to allow safe passage for the other player's Diplomats to the castle, so the Royals can sign a peace treaty with each other (although given the track record of monarchies, this peace treaty is no doubt extremely temporary). One difficulty of this game is that some pieces, like the Journalists and Politicians, can capture automatically in certain situations, and this means automatic loss for both players. This is obviously a very positional game. According to Jim, all pieces are positioned at random at the state of the game except for the Diplomats and Scouts. Pieces can move by stacking on each other, and when a player's piece is on the other half of the board, it becomes controlled by the other player. These gameplay mechanics all make Diplomatic Mission sound like a very interesting game, worthy of further write-up! Anyone who owns this game, help us figure it out. 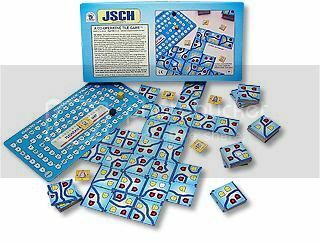 JSCH: Pronounced "ish," JSCH is a tile game with a story about aliens observing the battle between good and evil on planet Earth. Each player has a pool of tiles and draws them one at a time, placing them on the board. Each tile has within it a border, some yellow shields (representing good), dark shields (representing evil), and white shields (representing the undecided). The objective is to enclose areas using borders so that the enclosures contain more yellow shields than dark shields. All the reviews I've read for this game have been negative: problems cited include the irregular pattern of the borders making it difficult to create enclosures, and the gameplay being deficient for only two players. Jim says that each player has a stack of tiles. When a tile is played, the next tile is shown, bringing in an extra element of strategy, as the players can plan one move ahead. Also, there are 5 counters representing aliens, each having varying strength, which help you outnumber the dark shields. It's really too bad that this game doesn't seem to work out well, because it's a very original concept. Warp 'n Woof: A backgammon-like game played on a 5x5 grid with paths of four different colors which cross each other at many points. The goal of the game is for all players to get to the end of their path, which sounds easier said than done when there are traffic jams all over the place. As in backgammon, the dice tell you how far you can move, but players must also build bridges so other players can move past them. According to reviews, this is an excellent game, and relatively easy to win as long as you know how to use the bridges mechanic. 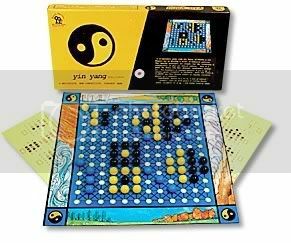 Ying Yang: A positional game played on a 12x12 board, using four dice (two for each player) to determine movement. According to Family Pastimes, the objective is to develop balanced patterns, and a simpler game is also included for younger players. I have no more information on this. Maze: This game is actually located on the Multi-Age page. 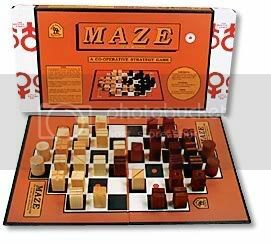 Very little detail is available on Maze, but it is a positional game where you must bring a piece called "mate" to the other side of the board. An interesting aspect of this game is that it can be played solitaire also, although I don't know how. If you have played any of these games and want to submit a review, please email me.